Organic buckwheat has been used for centuries in various ways. Originating from Far East Asia, not only has it been consumed as a nutrient-dense superfood apart of a healthy diet, it’s also a natural, and even therapeutic, pillow filler. Indeed, organic buckwheat pillows have rich benefits for sleep, too. They’re perfect for keeping your head cool, and in the perfect alignment with your spine while you sleep so you don’t wake up with any uncomfortable pains from bad posture. Organic buckwheat pillows are also hypoallergenic, and allergen resistant. What’s more, some people with chronic migraines, have even benefited from organic buckwheat pillows, as they have a gentle “massaging” effect, due to the shape of the buckwheat hulls. To learn more about the benefits of organic buckwheat pillows, read on and discover the miraculous benefits of organic buckwheat! Organic buckwheat pillows don’t collapse under the weight of your head like most feather, down or polyester pillows do. 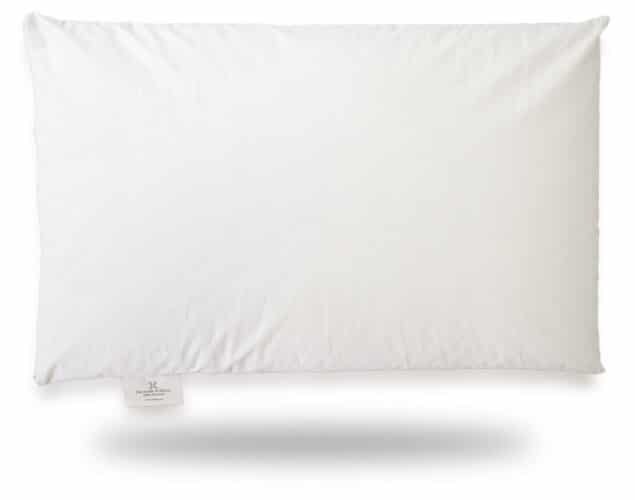 An organic buckwheat pillow maintains its shape throughout the night to support your neck and head. Indeed, the organic buckwheat hulls shift and mould to the shape of your head, so you always stay in the anatomically correct position all night long. And speaking of positions, not only does organic buckwheat help you keep your body in the right position while you sleep, it also help you improve your body posture over time! By sleeping on an organic buckwheat pillow, you’ll also notice improvements to your natural body posture while you’re awake, too! Because organic buckwheat pillows help you stay in the anatomically correct position while you sleep, there is less strain imposed on your body. If you have a “bad back” or a “bad shoulder”, it might be because your posture isn’t properly supporting them. Some individuals have reported feeling better after sleeping on an organic buckwheat pillow. And, it has also been prescribed by medical professionals, to people who experience pain in their back, neck and shoulders, as a completely natural way to soothe longterm pain. So, if you’re searching to improve your posture and to experience fewer pains during the day, an organic buckwheat pillow may help you! Organic Buckwheat is extremely breathable. Indeed, it’s a great pillow for the summer time, or if you tend to overheat while you sleep. An organic buckwheat pillow also has a nice “massaging” effect on your head, due to the triangular shape of the little buckwheat hulls. This therapeutic effect has been known to help reduce bad headaches, and reduce stress. Sadly, all buckwheat pillows aren’t created equal. Indeed, it is common practice for buckwheat hulls to be washed and sprayed with chemicals before being used for pillows. Our buckwheat hulls are locally sourced from small farms in Slovenia. They are washed in clear water, and dried naturally. No chemicals were involved in the process, because they’re just don’t need to be! Buying an organic buckwheat pillow is always the safest bet, and will keep you from breathing in potentially harmful chemicals, such as pesticides, flame retardants or paraffins.